Paramount's Terminator Genisys wasn't exactly the box office behemoth the studio was hoping for last summer, taking in just $89.7 million domestically. The sci-fi sequel did fare much better internationally with $350.8 million, for a worldwide total of $440.6 million, from a $150 million budget. The studio had been planning two more sequels for several months before the movie opened, but the status of those projects are still in limbo. Even if they do move forward, it seems they will happen without Terminator Genisys star Emilia Clarke. Here's what she had to say, when asked if she has signed on to return for the sequels. "No. Can I say that? It's okay. No. Uh-uh. But I have some very different roles coming up." This news comes from Coming Soon. The studio announced in September 2014 that they were moving forward with two sequels to Terminator Genisys, nine months before the movie debuted in theaters. Paramount set a May 19, 2017 release date for Terminator Genisys 2, and a June 29, 2018 date for Terminator Genisys 3, and they were also developing a new TV series as well. Just a few weeks after Terminator Genisys opened in theaters, a report surfaced that claimed both sequels and the TV show weren't set in stone. After the movie opened big in China, Skydance Productions, which produced and co-financed Terminator Genisys with Paramount, revealed that the Terminator sequels were still happening, but they were being "re-adjusted." Just last month, Arnold Schwarzenegger claimed that he was very much looking forward to doing the sequels. The last update we had on this sequel saga was in January, when Paramount yanked Terminator Genisys 2 out of its May 19, 2017 release date, with the new Baywatch remake set to take its place. The studio didn't issue a new date for Terminator Genisys 2, but, oddly enough, the studio didn't move the June 29, 2018 date for Termiantor Genisys 3, so it seems these sequels may still happen, at some point. 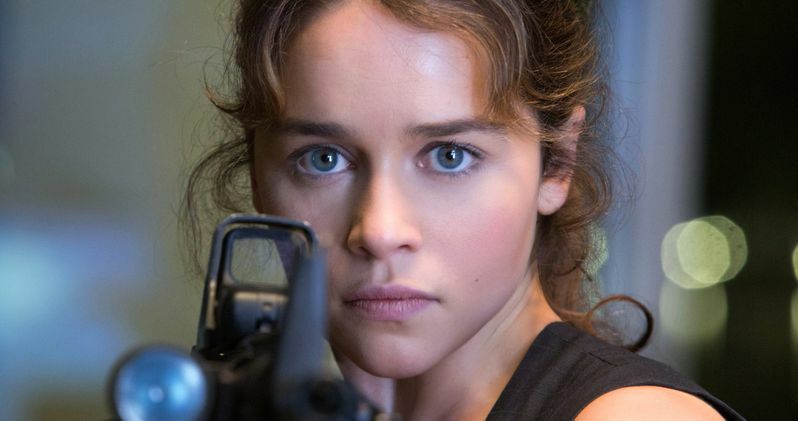 Still, the news that Emilia Clarke won't be returning as Sarah Connor is certainly intriguing, which could either mean the studio will recast this iconic role, or the sequels simply won't focus on her at all. The rights to the entire Terminator franchise will revert back to director James Cameron in 2019, 35 years after his 1984 classic The Terminator was released. This is likely why the studio set 2017 and 2018 release dates for Terminator Genisys 2 and Terminator Genisys 3. It isn't known if the director has any plans to revisit the franchise after the rights revert back to him, but he'll certainly be busy in the meantime. The filmmaker revealed last week that Avatar 2 has been pushed back to December 2018, with Avatar 3 debuting in 2020, while Avatar 4 and the newly-announced Avatar 5 will debut back-to-back in 2022 and 2023. It's possible that Terminator Genisys 2 and Terminator Genisys 3 could hit theaters in 2018 and 2019 respectively, before the rights shift back to James Cameron, but Paramount's plans for this franchise are becoming more and more unclear. As of now, the sequels don't have any writers or directors attached, and it isn't clear if Terminator Genisys director Alan Taylor or writers Patrick Lussier and Laeta Kalogridis will be back for the follow-ups. Stay tuned for more on Terminator Genisys 2 and Terminator Genisys 3 as soon as more updates come in.